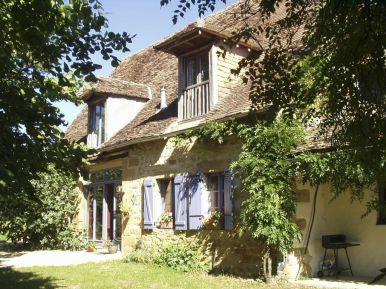 Les Valettes is a large traditional 6 bedroom farmhouse in the heart of the Dordogne, situated in a peaceful little hamlet in the middle of the gorgeous French countryside. The detached centrally heated farmhouse, incorporating a barn conversion, features a spacious dining room, a large lounge with a woodburning stove within the original stone fireplace, a fully fitted and equipped kitchen and a utility room with downstairs wc, and 6 bedrooms plus a nursery. The 6 bedrooms include 2 master ensuite bedrooms, one with an ensuite nursery, and a ground floor wheelchair accessible twin bedroom with ensuite wet room/wc. There is a large (10x5m) outdoor dining area naturally shaded by a pergola with built-in barbeque, lighting, power and water, which could be converted to additional living space or triple garage subject to planning permission. 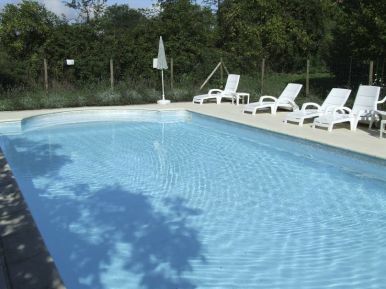 The swimming pool measures 10x5m (32x16 feet approx) plus Roman steps at one end and is surrounded by a paved deck and secure fence outside which is a secure underground pump and filtration chamber. The farmhouse buildings and pool stand in approx. one and a half acres (half a hectare) of land including a walnut grove providing shaded parking in Summer. A small barn comprises workshop/garden store and log store with small storage sheds under. The house is fully furnished and equipped as a gite, but would also be ideal to let a gite, split into two gites or run as a bed & breakfast guest house.